The elderly man in the cycle hire shop in Yangshuo eyes me up. He is concerned about the return of his bicycle in a working state if my huge posterior goes the full distance to Fuli. With much gesticulation and discussion it becomes apparent that I must 'take it easy'. What does he expect from a very slightly over-weight Westerner. I am sure his bicycle has been further with greater weight when you look at the uses of bikes in this corner of China. Wobbling my way down the road, I hear his chuckles at my forgotten skills. The slightly hot, sunburnt gweilo can't even remember how a bike works. I decide to get this torture over with as soon as possible and head to the corner where I know I will be out of sight. However, this is not the end of the torture. 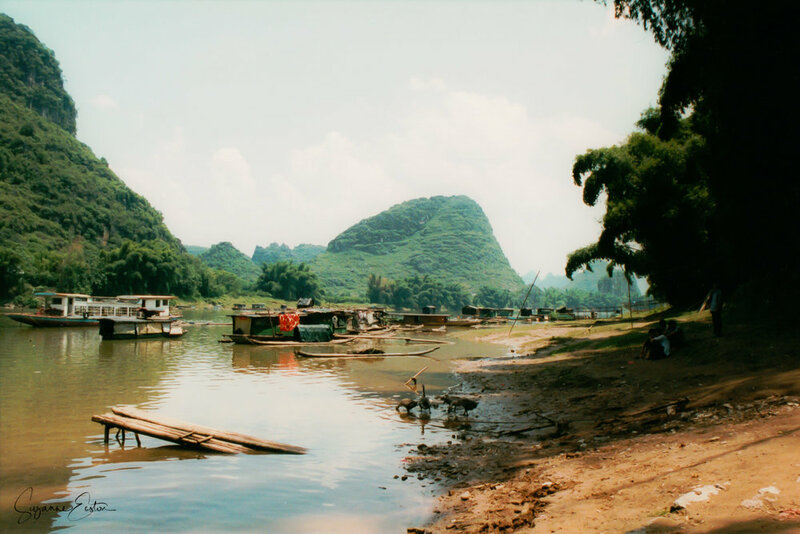 When I agreed to this stupid plan I thought I would be cycling along the edge of the Li River enjoying the morning sunshine before reaching the small village of Fuli in time for a refreshing glass of Liquan (the local beer) and some retail therapy. Instead I am trying to remember how to ride a bike (how fictional is that phrase!!) on a dusty main road with lorries and cars speeding by. This is not my idea of fun and eventually my displeasure is noticed and a concerted effort is made to find the path along the bank of the river. Possibly he realised that his idea of a fun day out was in jeopardy before it had really begun! There is a momentary sigh of relief as we head from the main road only to realise that the track to the ferry is rough, exceedingly rough. Too rough if you haven’t ridden a bike for over 10 years. But after a few undignified moments, sliding ungracefully to the ground I have it sussed. The miles are passing by and the bend in the river at Dutou where we have been told the ferry goes from finally comes into view. The ferry is busy, the only link between Dutou and Fuli. It is more like a motorised wooden raft than a ferry or even a boat for that matter. We board along with three older ladies and two young boys. Everyone is silent, watching each other, the differences between our mannerisms and build being absorbed. The ladies are the first to giggle. Their eyes asking questions that words cannot complete. There is more giggling and then the first gentle glance of a hand. I respond with a smile. Yes, I am a very pale rose white English girl. After three weeks in the harsh and dirty Chinese landscape my freckles are joining together, but I am still pale. They want to see the tide mark of my t-shirt, just to make sure I have got some tan. It’s there but vague, the religious application of factor 50 sun cream has done its job. Passing the first test they move to my legs. A small poke and then something more substantial followed by lots of discussion. I think they realise that my legs are solid and large not squishy and fat. Then their trousers are rolled up. It reminds me of the 1950’s British summer fun of a knobbly knees competition on the pier. I am not going to win this one, other than sheer girth which is not winning them over they have far better legs than I will ever have. While I am navigating my way through the conversation with the three ladies (who will recount this encounter for months to come I am sure) two boys are trying to contain some over enthusiastic chickens. Their destination, the dinner table tonight via the market across the river in Fuli is almost guaranteed. Their heads keep emerging from the straw basket, before being forced back down into the cool darkness. Escape bids are numerous and the boys are fully occupied with keeping their wares contained. I’m not sure whose idea it was but before we know it our bike wheels are being spun. Bored boys are inventive. Spinning the wheels keeps the chickens in the basket, that is until it doesn’t. And when it doesn’t small boys find a concussed chicken hideously funny. So funny that they have to allow it to happen again just to see if the response is the same. Walking up the steps in Fuli it seems like the most surreal ferry journey in my life. However, this market is full of further surprises. From the noodle shop with its huge machine requiring a ladder to reach the top where the ingredients are added to the roadside physician carrying out the ancient method of cupping it is all happening. We see the two boys briefly, their chickens handed over, the straw bag being used as a kite as they head back to the ferry. In the middle of the market are the hairdressers. Lined up with their chairs and mirrors it is a constant service. A thought crosses my mind. He’s been unshawn for a month now, can I get his straw like thatch trimmed? We walk around watching the barbers work, some are fast, their scissors and razors flashing in the light. Others are slow and meticulous, their customers enjoying the experience and a chance to chat and catch up with a friend. I suggest the time is right and watch the colour drain from his face. A Chinese haircut was clearly not in his game plan for the day. Eventually we find a lady with a kind face, a fast worker but not scary (apparently some of their razor work was nothing short of a Sweeney Todd experience!) that was until she took a small razor blade and started to insert it into a left nostril. I could feel the laughter building and glancing around at the spectators now gathering around us I knew I was not alone. I was going to explode at any minute and as the lit piece of paper was inserted into his right ear to remove those pesky hairs it happened. I am sure forgiveness will come, but I see it as compensation for making me ride a bike after all these years. When the torture was complete I take my sulking husband to find liquan as promised. The back streets of the village are basic, the homes small. Catching glimpses of life in the small Chinese village brings home the realities of life in this huge country. We find a bar by the river. Well we think it is a bar. There are small tables with equally small chairs and a game is being played by four elderly gents at a corner table. We take a seat, squeezing our large torsos (as highlighted by the ladies earlier in the day) into the pre-school sized arrangement just to see what happens. We are lucky this time. Our guess was right and a friendly waiter comes over. He spies the new haircut, razor nicks and all and in broken sign language comments on how brave he is to have such a short cut. I see his eyes glow with that moment of - you owe me for this. I think I paid my dues, cycling back pretending to enjoy the experience with a head full of liquan. It is a stunning landscape and the vast peaks are something I will never forget. However I was glad to hand the bike back and listen to the owner chuckle again as I walk away rubbing my slightly sore posterior. All of this got me thinking about how we see other people and how small adventures can break down the barriers. None of us planned the day that evolved or the encounters we had, but without that ferry ride all of our days would have been different….